A CHARMING DETACHED CHARACTER HOUSE SET ON A LARGE PLOT ADJOINING FIELDS ON THE EDGE OF THIS POPULAR VILLAGE. This lovely family home has been attractively refurbished and benefits from having planning permission to enlarge in the future and presently provides well proportioned and presented accommodation set over two floors with an entrance hall, living room, dining room, kitchen, cloaks/shower room and a lean to on the ground floor. Upstairs there is a lovely master bedroom, two further bedrooms (a double & a single) and a family bathroom. The gardens are a particular feature of the house and to the front there is parking for several vehicles, a garage and useful outhouse/studio. The rear garden is of a particularly good size and has lovely views over countryside. 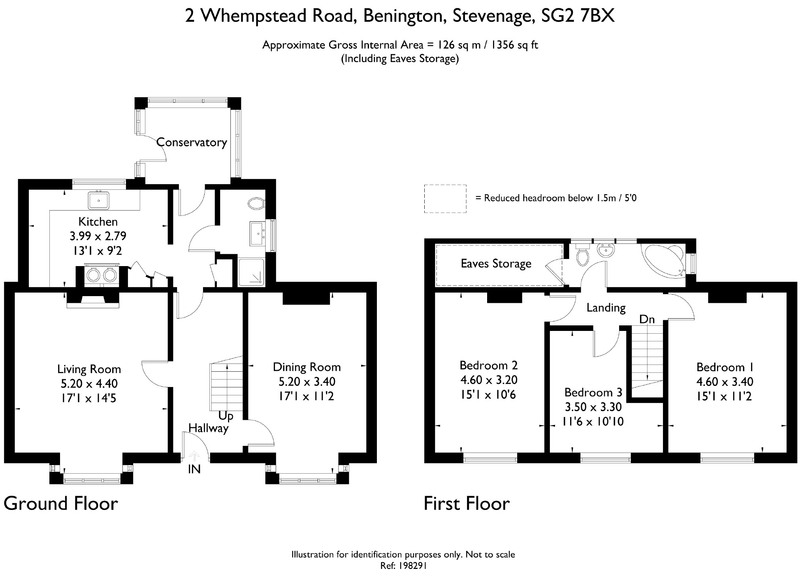 Location - Benington is a small, picturesque village set in the Hertfordshire countryside and has been described as one of the most attractive villages in the county. The village has a strong farming history, and much of the surrounding countryside is still agricultural. It has a population of just over 1000, two churches, a primary school, two public houses, and is home to Benington Lordship with its well known gardens. Located just a few miles to the north of Ware and Hertford and 35 miles north of London. Local railway stations are in the neighbouring village of Watton at Stone (Moorgate & Finsbury Park), Ware (Liverpool Street), Hertford (Moorgate & Liverpool St) and Stevenage (Kings Cross). The A1(M) and the A10 are both within a 20 minute drive and subsequently link to the M25. Entrance Hall - 15' x 6'8 (4.57m x 2.03m) - An attractive hallway with cast iron radiator. Stairs to first floor with cupboard beneath. Dining Room - 17'7 into bay x 11'3 (5.36m into bay x 3.43m) - Large double glazed window to the front aspect. Cast iron radaitor. Chimney breast with wood burning stove and cupboards to side of chimney breast. Living Room - 17'7 into bay x 14'5 (5.36m into bay x 4.39m) - A lovely room with large double glazed bay window to the front aspect and double glazed window to the side aspect. TV point. Attractive fireplace and wood burning stove. Cast iron radiator. Rear Lobby - Door to Lean to. Useful shelved cupboard. Kitchen/Breakfast Room - 13' x 9' (3.96m x 2.74m) - Attractively fitted with a good range of wall and base level units with worktop surfaces and Butler sink unit with mixer tap. Built in oven and four ring gas (lpg) hob with cooker hood over. Shelved larder cupboards. Double glazed window to the rear overlooking the garden and countryside beyond. Tiled surrounds. Flagstone floor. Integrated dishwasher. Cloaks/ Shower Room - Fitted with a contemporary suite with low level wc, wash basin and fully tiled shower cubicle. Further tiled surrounds. Ladder style towel rail. Inset downlights. Tiled floor. Master Bedroom - 15'1 x 11'3 (4.60m x 3.43m) - Double glazed window to the front aspect. Cast iron radiator. Bedroom Two - 15'3 x 10'6 (4.65m x 3.20m) - Double glazed window to the front and side aspect. Cast iron radiator. Victorian style fireplace. Bedroom Three - 11'6 x 10'8 max narrowing to 7'3 (3.51m x 3.25m ma - Double glazed window to the front aspect. Cast iron radiator. Family Bathroom - Double glazed window to the rear overlooking the garden and with far reaching views over the countryside to the rear. Double glazed window to the side aspect. Bath with hand shower attachment. Low level wc. Wash hand basin. Half tiled walls. Ladder style towel rail/radiator. Door to walk in loft room with useful storage. Front Garden & Driveway - The property set back from the lane and screened by mature hedging. The gravel driveway provides parking for numerous vehicles and leads to the garage. Within the front garden is a useful store/studio room 13'6 x 8'6 th with windows to the front and side aspect. Detached Garage - 18'8 x 9' (5.69m x 2.74m) - With up and over door. To the side of the garage is a useful log store. Large Rear Garden - The rear garden is a particular feature being of a good size and adjoining countryside. Being laid mainly to lawn with shrubs and flower beds. Within the garden there is also a useful large garden shed/workshop together with a smaller rustic shed. Agents Note: - Local Authority: East Herts DC 01279 655261. Planning Permission has been approved for a substantial side extension to the property.